Nothing distinguished what trendy young people in my day called a “den” so much as precise, geometrical framed prints. They defined who you were. For me it was sometimes a tramcar, an aeroplane but most usually a car. I liked them to have an engineering quality. No perspective, just good detailing and exactitude, with correct colours and a crisp texture. All they needed was a modest caption with title, date and maybe a few technical facts. Prints like that made a statement. Maybe they are now passé but I still treasure some; Glasgow tramcars recall my youth, aircraft like a BEA Pionair (a Dakota really) in which I made landmark flights to London. I have one of a 602 (City of Glasgow) Squadron Spitfire that flew from RAF Westhampnett, the Goodwood circuit where I covered races and drove many memorable laps. 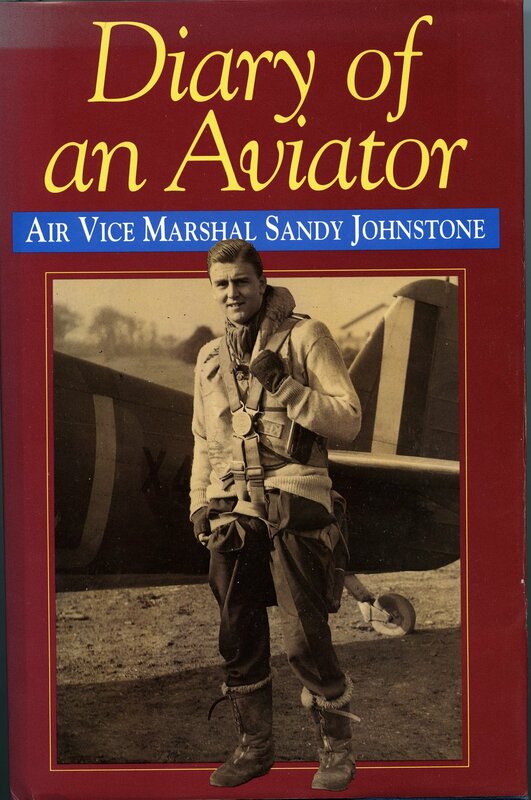 Sandy Johnstone, Air Vice Marshal Alexander Vallance Riddell Johnstone, CB DFC AE DL (1916 – 2000) signed it. We used to live next door to his son, Brigadier Iain Johnstone. When we published our Jim Clark book, Iain mentioned that his dad had also just done a book. Never mentioned that it was his story of an amazing life, into which Sandy dropped names like confetti. Yet this wasn’t gratuitous “name-dropping”, he really had met King George VI, Winston Churchill, Dwight D Eisenhower, Field Marshal Montgomery, Earl Mountbatten and been present at turning points in history. He was with the Duke of Hamilton when Deputy Führer Rudolf Hess flew his Messerschmitt 110 to Dungavel in 1941. I was seven. I remember things from when I was seven. The great Sandy and I swapped books. 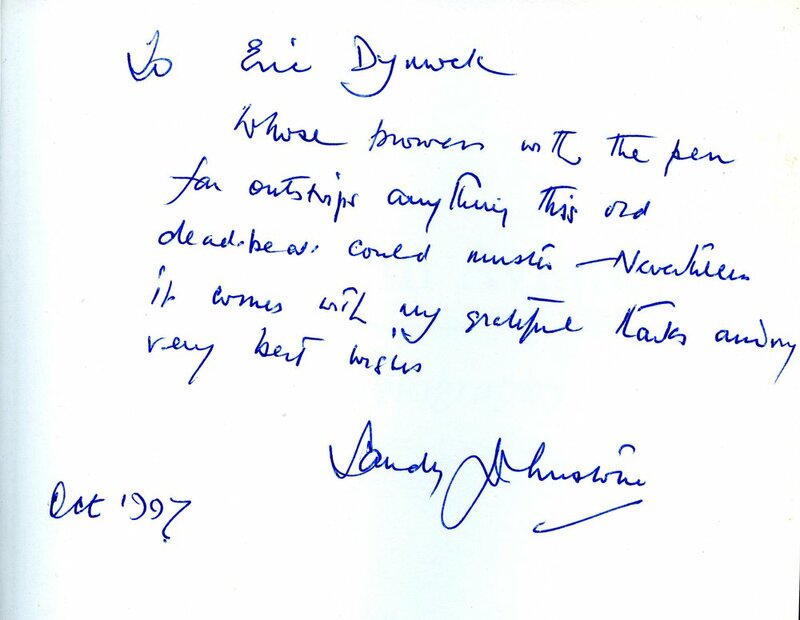 I inscribed his Jim Clark, Tribute to a Champion, “…about one Scottish hero to another Scottish hero.” He kindly dedicated my copy of his Diary of an Aviator (Airlife 1993 ISBN 1 85310 430 2) and followed it with a delightful letter of congratulations. I am name-dropping now. Behind my desk, Squadron Print of Sandy Johnstone’s Goodwood Spitfire. Jacket of his book. His dedication of 1997.